I asked my husband recently why he was making sandwiches for lunch and not his favorite salad. This midday change was noticeable because the man fiercely protects his routine and his mainstay lunch is a bed of fresh leafy greens covered generously with chunks of leftover grilled chicken and drizzled with balsamic dressing. The key ingredient for him, which kept the salad interesting for years upon years upon years—not kidding—was Paisley Farms All Natural Four Bean Bean Salad. We'd buy it in the super-size 64-ounce jars at Costco. One might be induced to think it was the first signs of the apocalypse if—horror or horrors—our family ate through the reserve supply in the pantry. This planning misfortune happened a couple of times, and when it did, I was hustling (and I do mean hustling, as in two-stepping double-time) to Costco to replenish our inventory. I'd buy as much as six mega jars at a time to restore the balance of peaceful harmony in our home. 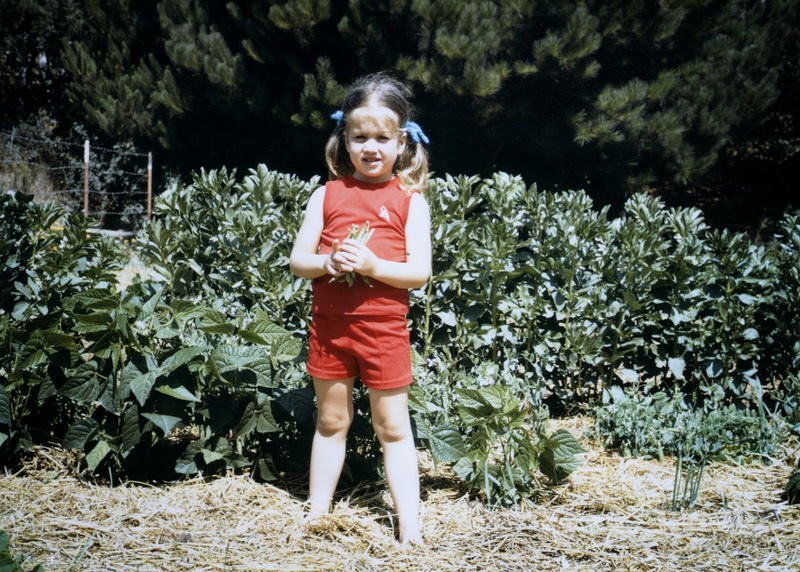 on our family farm circa 1970. For an excruciating period of time last year, especially for my husband, Costco stopped carrying the bean salad. Not one warehouse employee that I spoke to knew when the supply had ceased or why it had stopped. However, they could all agree that there was none to be found in the store. When a cashier politely asked me if I had found everything I needed, I replied no. And then I would repeat my tale of woe to the poor soul. Every cashier uniformly replied with an air of sincerity, as if he or she had been through a customer care training on the subject, that the item was indeed very popular and that customers were complaining about the disappearance. I so badly wanted to suggest that they hire Scooby-Doo and The Gang to solve the mystery of the Curious Case of the Missing Four Bean Salad. Then miracle of miracles, the salad reappeared on Costco's industrial metal shelves. Angels in the heavens burst into song. The packaging was different but the ingredients listing was the same. In lieu of one big jumbo jar, the salad was packed into two smaller jars that were "handcuffed" together with a plastic contraption. I almost broke one of the jars at home while attempting to free it from the plastic teeth embedded in the inner circle of the cuff. This did not feel like progress. Clearly, with these types of packaging changes, the consumer loses. The price increased, the overall portion size diminished, and the recycling bin gained more glass and plastic. I begrudgingly resigned myself to paying more and getting less. Fine, we'll deal, I thought to myself. At least we have the bean salad back. The earth could resume spinning on its axis again. I can assure you that folks will put up with a lot of crap just to try to get back to "normal". Salads for lunch became a staple again. It was the "salad days" once more until Costco mysteriously stopped carrying the bean salad yet again. Aggravation ensued. Interrogations began. A cornered Costco employee responded feebly to my direct questioning that bean salad might be a seasonal item, stocked only during the holidays. Whatever, Costo. Whatever, Paisley Farms. That's that, I thought, and enough's enough. The way forward was to to tap into a consistent supply of bean salad so that I could pull my partner-in-life back from the proverbial ledge, the streets below littered with chopped Romaine and shredded carrot. While I was growing up my family always made our maternal grandmother's marinated bean salad recipe. We loved it. The salad was a mainstay at Thanksgiving dinner and at barbecues throughout the year. After I decided enough was enough (and Donna Summer's mega hit song began playing in the commercial-free radio station in my head), I tried making my family's beloved recipe again. Sadly, hubby declared it a misfire, even though we both liked it "back in the day". I always find it interesting, and perhaps a little confounding, how our taste preferences change over time. Nana's recipe called for equal parts oil and red wine vinegar along with granulated sugar and salt. Jay despised the oil in the dressing, and I had to admit that after eating the oil-free Paisley Farms salad, I had grown accustomed to the sweeter and tangier taste without the oily residue on the tongue. It took two attempts to adjust Nana's recipe to what we were looking for flavor wise—more sweet and tangy than sour. The bonus is that the salad tastes fresher than what we purchased at retail, and it is less expensive, too. And, more importantly we have a guaranteed supply so that Jay can get back to eating and thoroughly enjoying his favorite weekday lunch. Plus, as an added bonus, I can skip the Donna Summer disco track, and proceed to the next song on the ever running play list in my mind. Granted this recipe, as written, makes a lot of bean salad and you can certainly halve the proportions if it is more accommodating to your lifestyle. Around my house this is probably a two-week supply. Between the sugar and the vinegar, this salad doesn't really seem to perish kept under refrigeration. I'm sure it has an expiration time frame, like everything else in the world, but we haven't found it yet. Yes, the marinade has a lot of sugar, but we scoop up the beans and let the marinade drain away, so I'm always wondering in the end how much sugar we are really consuming when we eat this salad. Linda said that she is going to work on a unrefined sugar version, so stay tuned for that. Along with the drained bean salad, Jay likes to top his salad with a handful of sliced grape tomatoes along with a shower of chopped walnuts, some shredded Parmesan or cheddar or crumbled Gorgonzola, and a few grinds of black pepper. Sometimes he gets a little wild and adds a few sliced black olives. As I mentioned previously he likes to push the tangy flavor even further by using a Balsamic Vinaigrette. That boy must have been weened on a pickle. I prefer a Ranch-style Buttermilk dressing for this particular salad. 2. In the meantime, in a saucepan combine the granulated sugar and water. Over medium heat, let the sugar melt, stirring occasionally. Once the sugar has dissolved, turn off heat. Add salt, stir to incorporate. Let cool. 3. Finely dice the bell peppers and yellow onion and add to drained beans. Toss gently to mix and transfer to a container with a tight fitting lid such as a Cambro. (A 4-quart Cambro is the perfect size for this recipe.) Pour the cooled marinade over the bean mixture. Seal with lid and shake to distribute the marinade over the top of the beans. Refrigerate. Every once in awhile shake the container to redistribute the ingredients and let sit for a minimum of 24-hours in the refrigerator before serving. The salad will keep a month or so, stored properly. Serve with a large slotted spoon to to allow the marinade to drain back into the bowl. My husband Jay made this salad and was a little flabbergasted with me for making him wait to eat his lunch while I took a photo. Yep, that's what it's like being married to a food blogger. Thank you Ladies, you are my salads salvation. I stumbled upon this post after searching for recipes to use with the Paisley Farms 4BS. I literally just bought the "handcuffed duo" at our local Sams Club in Little Rock, AR today!!! You can order online so if you don't have a Sams Club maybe go that route!!! I hope you have found some by now though! However the homemade version looks fab!